At first glance, Granitos (translated Little Grain), are pearl-like dots stitched in the fabric. The stitch requires no under-padding, but instead, the working thread is mounded continuously until the desired effect is obtained. This consists of only two stitching points, A to B, repeated over and over causing the stitches to mound over until they resemble a small dot in the fabric. This is similar to what you may have experienced while machine stitching and the foot of the machine gets stuck in one place, so the stitches keep mounding up. Granitos can be rendered correctly up to a certain size so if a larger dot is required, another technique such as padded dots can achieve the desired effect. I prefer to make my Granitos sans-hoop while working over the finger. 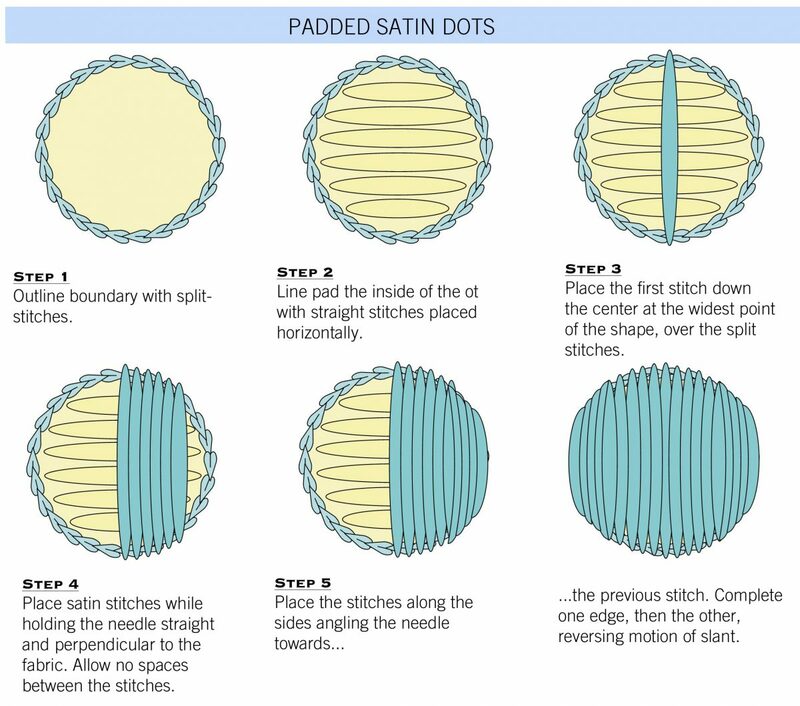 Padded satin dots are completely different. The area of the dot is outlined with a very secure foundation stitch such as split-stitch or stem stitch; I prefer the former. The inside of the dot is padded either with “line padding” or chain stitching. Line padding can be layered by alternating stitch directions from one layer to the next, first beginning in the centermost point of the dot and gradually getting wider as the layers are added. The final layer should lay perpendicular to the satin stitches so planning is essential. It is said that every embroiderer is judged by her skill in making padded satin dots so can be quite challenging to master. It’s easy to go completely wrong while stitching these tricky little round circles, but with a little practice and the correct techniques, you can achieve mastery with a few tidbits of techniques and a lot of practice. Padded dots are best worked in hoop to prevent the dots going oval. 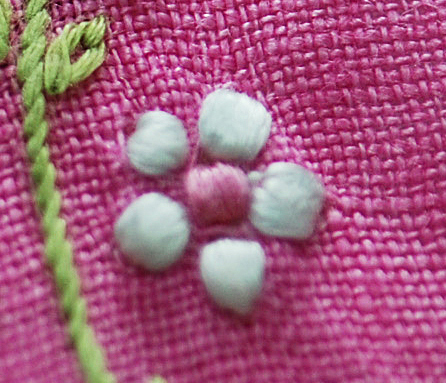 I hope you try both techniques and before you know it, you’ll be including them in your embroidery projects regularly. The accomplishment is enormously rewarding and the effect is absolutely intriguing. Please check back for additional stitch techniques pertaining to this design. If you would like to purchase a copy of Babes in Blue pattern, please contact me via email: wendschoen@aol.com.